I made it back from Guatemala after a jam-packed week of labor and ministry, and the purpose of this writing is to encourage you in the Lord. I want to explain how the trip went from my perspective… as well as show you the greatness of our God. I traveled with five other gentlemen (under the organization Agua Viva International) to the Shadow of His Wings Orphanage in Monjas, which is about 3-4 hours east of Guatemala City via pot-hole-riddled road. First of all, let me just say that this country is beautiful. The forests and mountains are awe-inspiring. 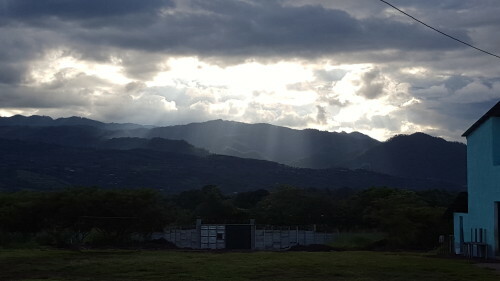 I probably have 40 pictures on my phone of the same mountain in front of our cabin…such as this picture where it looks like Jesus is about to return. But thankfully, we serve a faithful God, and even those kids who are sent away after a short time, we can be sure that the same One who brought them there for a short season will continue to pursue them and help them throughout their precious lives. Many of the children at SOHW have been there for quite some time and have shown tremendous growth from broken, fearful, isolated individuals to now joyful, peaceful kids who are learning to trust again. 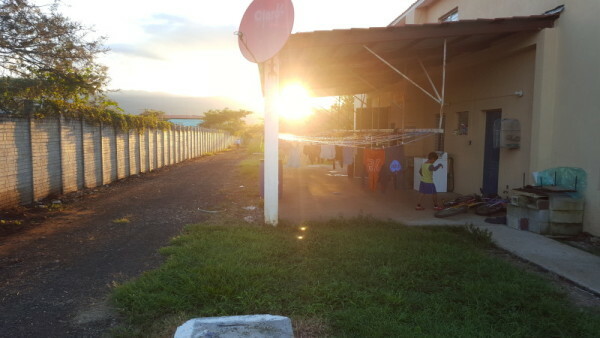 The orphanage divides the children up into a handful of “families”, each with a separate house led by a “Mom” and “Dad”. These parents are the big heroes who spend every day bringing peace and order to a household of wounded kids. They will be rewarded greatly for their service.